California Sparkling Wine Making a Comeback After a number years in which California sparkling wine was in the doldrums and a hard sell, many boutique Pinot Noir producers are now producing stellar examples that have revived interest and are “sparking” a mini-trend. Sta. Rita Hills producer Kessler- Haak is offering their inaugural release “sparkling brut squad,” consisting of a sparkling Brut (75% Pinot Noir and 25% Chardonnay) containing all Sta. Rita Hills estate fruit and a sparkling Brut Rosé (100% Sta. Rita Hills estate Pinot Noir). Both wines were produced by méthode champenoise with 10 month tirage. Brewer-Clifton is announcing their release of their 2011 3D Vineyard Sparkling Chardonnay made in a blanc de blanc style. This is the second vintage of sparkling wine made in the traditional méthode champenoise and hand disgorged at Brewer-Clifton winery. Also in Sta. Rita Hills, Flying Goat Cellars has been featuring “Goat Bubbles” for several years. Three outstanding sparklers are now offered: 2010 Goat Bubbles Blanc de Blancs Sierra Madre Vineyard (previously reviewed in the PinotFile and rated 94), 2011 Goat Bubbles Rosé Solomon Hills Vineyard, and 2011 Goat Bubbles Crémant Sierra Madre Vineyard. A favorite of mine is the Brut Rosé Sparkling Wine offered by Inman Family Wines sourced from the OGV Estate Pinot Noir. The 2012 vintage can be ordered now for shipping in February 2014 (think Valentine’s Day). These boutique sparklers are not cheap, but reflective the quality of the grapes they contain and the more intensive winemaking procedures required to produce a high-end sparkling wine by méthode champenoise. Movie on Robert Sinskey Released Sinskey is an interesting study because he did not attend wine school, rather he received a Bachelor of Fine Arts degree from Parsons School of Design in New York City. Over the past 25 years he has grown the 100% organic and Biodynamic® certified winegrowing operation started by his father to over 200 acres of vineyards in the Carneros and Stags Leap districts of the Napa and Sonoma Valleys. Robert Sinskey Vineyards was one of the featured wineries at the 2012 IPNC and is a highly popular producer of Pinot Noir and Vin Gris of Pinot Noir. Visit www.cdsavoia.com/#!/artists/robert-sinskey. Dolin Malibu Estate Vineyards This new label was inspired by a backyard Chardonnay vineyard Elliott and Lynn Dolin planted behind their Malibu home in 2006. 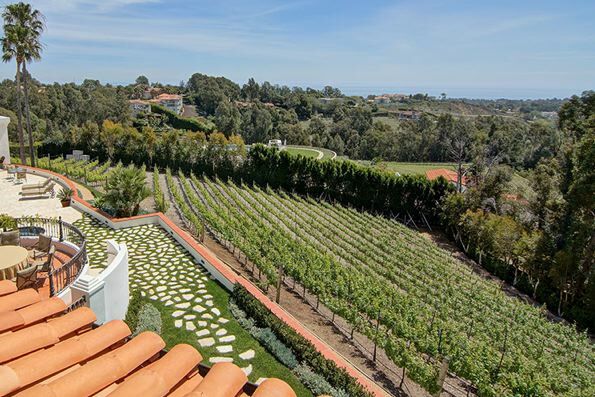 Since its launch in 2005, Dolin has emerged as one of the leading producers in the burgeoning Malibu Coast, a region poised to attain AVA status in early 2014. After three vintages of Chardonnay, the winery is expanding its Malibu production to include several more wines from the region and by the middle of 2014 will release a line of Central Coast Pinot Noir wines from notable vineyards such as Talley Rincon, Bien Nacido and Solomon Hills. The winemaker is Kirby Anderson who crafts the wines in a Central Coast facility. Visit www.dolinestate.com for more information and to buy the 2011 Dolin Malibu Estate Vineyards Chardonnay ($39) or 2012 Dolin Rosé of Pinot Noir ($22). Darkest-Colored Reds are Healthiest Men’s Health recently reported that research by professor emeritus Dr. Leroy Creasy of Cornell University suggests that wines with the darkest skins that are grown at the sunniest sites have the most health benefits. Darker wines contain more anthocyanins, the antioxidants that are present in grape skins. Grapes that are exposed to the highest levels of ultraviolet light produce the highest amounts of antioxidants. It is believed that antioxidants such as resveratrol can reduce the risk of heart disease. Gift Tickets to World of Pinot Noir Your wine-loving friends have plenty of wine, but they would welcome a gift of tickets to the World of Pinot Noir, February 28 and March 1, 2014 at the luxurious Bacara Resort & Spa in Santa Barbara. 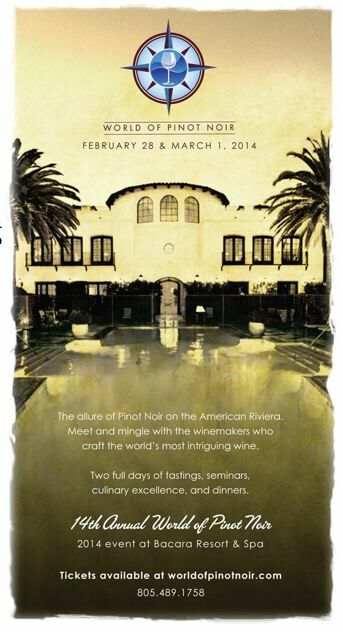 There will be opportunity to taste Pinot Noir from more than 100 domestic and international producers. Visit www.wopn.com for a schedule of events and tickets. Waving Inflatable Tubes Deter Birds from Grapes The Wall Street Journal and gizmodo.com reported that inflatable nylon tubes in the image of arm-flailing tube men are an effective deterrent to grape stealing birds at harvest. 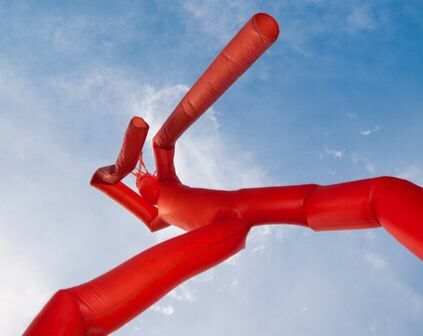 The Department of Agriculture is studying the comparable effectiveness of the bird repelling inflatable tubes to other conventional means of crop protection. “Pinot Express” Zipline Great Wine News (December 13, 2013) reported on a new 1,800-foot “Pinot Express” zipline at Margarita Adventures which starts on a mountaintop forest and descends over Pinot Noir vines at the historic Santa Margarita Ranch in Paso Robles wine country. The Pinot Express is the highest, longest and fastest zipline of the Margarita Adventures other four zipline tours. Cost is $99. Tours end with an optional wine tasting of Mike Sinor’s Ancient Peaks Winery wines which specializes in wines grown on Margarita Vineyard. See the video at www.greatwinenews.com/pinot-express-zipline-over-pinot-noir-vines/. 9th Annual Pigs & Pinot Weekend Chef Charlie Palmer again brings together the culinary and wine worlds on March 21-22, 2014 at the Hotel Healdsburg. Attendees experience the pork creations of 20 chefs and the wines of over 60 wineries. This year’s participating pork authorities are Amanda Freitag, chef and owner of Empire Diner and TV Food Network personality, Bryan Voltaggio, chef and owner of VOLT and RANGE, Frank Crispo, chef and owner of Crispo Restaurant and Philippe Rispoli, chef and owner of PB Boulangerie Bistro. Gala dinner winemakers include Michael Browne (CIRQ. ), Pierre Emmanuel (Domaine Pierre Gelin), Tom Rochioli (Rochioli Vineyards & Winery) and Mike Weersing (Pyramid Valley, New Zealand). All proceeds benefit Share Our Strength® and local scholarships and charities. Pigs & Pinot Hotel Lodging Package and a la carte ticket sales start Thursday, January 16, 2014. Visit www.pigsandpinot.com. New Online Wine Magazine: Grape Collective Former Wall Street Journal wine columnist Dorothy J. Gaiter and former Bon Appétit editor-in-chief Barbara Fairchild are notable contributors. The founder of the magazine is Christopher Barnes, the former president of the New York Observer, was inspired by the lack of digital platforms available to easily obtain wines that are written about. Subscriptions are free at www.grapecollective.com. Oh My God! Pinot Noir in a Can! Union Wine Company in Oregon has released a Pinot Noir in a 12-ounce can, hoping to “beerify” wine among consumers. 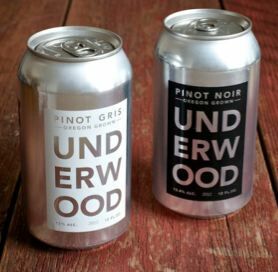 The label, Underwood, offers both Pinot Noir and Pinot Gris at a retail price of $5. The cans save about 40% in packaging costs compared to glass bottles. Burgundy Vigneron & US Music Exec Partner on Oregon Pinot Noir Wine Spectator (Katherine Cole, November 18, 2013) reported that California co-founder of I.R.S. Records Jay Boberg and vigneron Jean-Nicolas Méo, who trained under the legendary Henri Jayer, have formed a partnership to produce Pinot Noir in Oregon. Jean-Nicolas and Jay have been friends for over 30 years, and Jay has been a longtime friend of music industry veterans David Millman who is the managing directory of Domaine Drouhin Oregon and Scott Wright of Scott Paul Wines. In 2013, the pair will produce about 300 cases of Maresh Vineyard Pinot Noir. Kelley Fox, the winemaker for Scott Paul Wines, made the wine with consultation from Méo. Some whole cluster fermentation was used, with careful trimming of each cluster by hand in a certain fashion. Eventually, production will increase to 2,000 cases and will be moved into a separate facility for the 2014 vintage. The name of the new label has not been officially released. There will be a special cuvée from this partnership that will be released under the Scott Paul label sometime in 2015.